Automatic Rent Escalation. What is it? Why is it? Where is it? How? Can I eatz it? Each and every one of us has pondered these things many times in our lives. Well, wonder no more. I’m happy to announce that I have the answers to these questions! I’ve documented the answers in the artfully written post below for all of our collective benefit. What is Automatic Rent Escalation? Automatic Rent Escalation is a fresh off the grill, hot off the press, brand new feature Rentec Direct is offering which allows you to easily schedule automatic rent increases for your tenants. Enable the feature, answer a few simple questions, and let the Rentec Direct system automatically handle periodic rent increases for you! Remembering things is hard. It just is. We’ve all forgotten things. Whether that be taking the trash out on a Monday morning, feeding our pet hamster, or remembering the words to Jabberwocky before that big Jabberwocky recital you had to do in front of everyone but mostly in front of that one special someone you were wanting to impress. We know it can be stressful to remember things like this. Or, maybe your memory is like a Fort Knox of facts. You still remember the feeling of the cool fresh air on your skin the day you were born. Your memory could lift a 10 ton truck of barbells. There is no way you are forgetting anything. But, on the other hand, it is sunny outside and it would be nice to not have to spend time issuing rent increases. 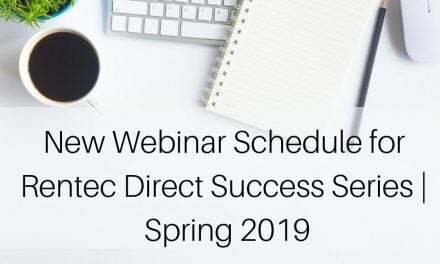 Rentec Direct is here to help! 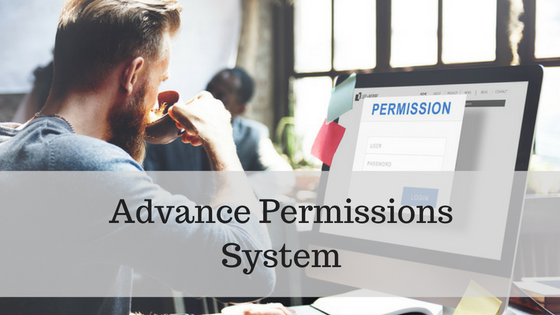 With the Automatic Rent Escalation feature you will neither have to remember nor work to issue a rent increase for your tenants, the software will do it for you, automatically. Get outside and take hold of that rainbow! Spend more time memorizing and impressing that special someone with a highly skilled and finely tuned Jabberwocky performance! It’s up to you! Where is Automatic Rent Escalation? That’s a wonderful question to ask, and I’m glad you asked it. The Automatic Rent Escalation feature can be found in two places! Two! The first place is on the Place a Tenant page where you can easily setup Automatic Rent Escalation settings at the same time you place a tenant. The second place is on the Update Lease page. 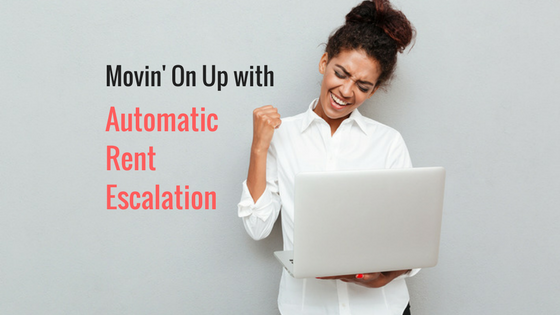 This allows you to easily add Automatic Rent Escalation to tenants who are already moved in. It’s so easy I’m going to do it right now, just for fun! How do I use Automatic Rent Escalation? Up until now you are no doubt impressed with the prospects of this new feature. Your idle hands are waiting in anticipation, ready to burst forth into furious Automatic Rent Escalation using action. Your fingers are twitching at the very sight of the word Escalation. Well, my friend, now is your chance! Below I have unlocked the secrets of using Automatic Rent Escalation through a thoughtful series of easy to follow directions with helpful pictures. Find the Place New Tenant option for the property you are wanting to place a tenant in, under the Properties Tab. Answer the questions to setup Automatic Rent Escalation. It is done! A rent increase will now be issued automatically on the date you specified at the interval you specified. It is that easy. Excited to see the fruits of your labor?! To see what your hands hath wrought visit the Update Lease page for the tenant you just placed. Observe the power you have wielded. Observe that which you have accomplished. You did this! No worries! It’s ok 😁 If something about the Automatic Rent Escalation settings is incorrect you can edit it using the Edit Automatic Rent Escalation Settings button! (It exists! Check the image above). The interface for changing settings is the same as when entering the settings so you can confidently change those settings at your very whim. Exert your influence. You are a strong confident Automatic Rent Escalation settings changer. If you are like me and think it’s pretty cool to be able to enable Automatic Rent Escalation when placing a tenant, then wait for what I’m going to tell you next. (Psst… Guess what? You can enable Automatic Rent Escalation when Updating a Lease.) I know right?! I’m super excited too! Let’s get to it and Update some Leases. 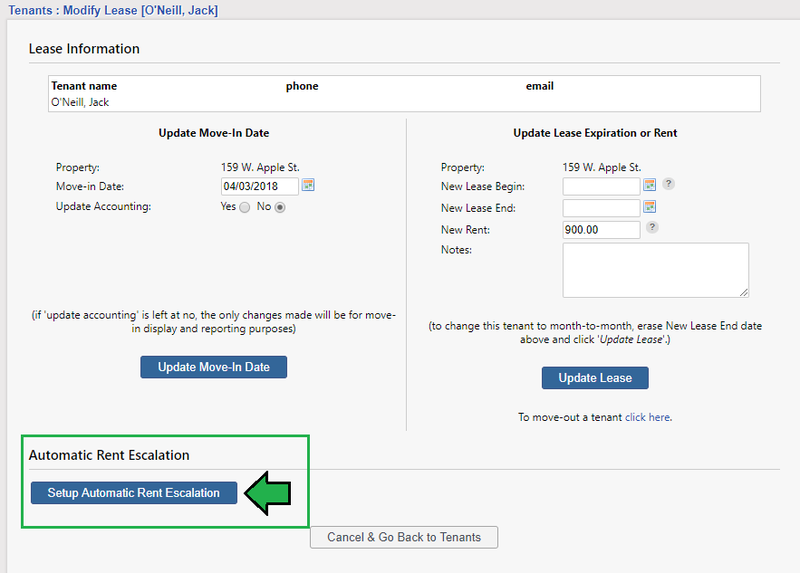 Navigate to the Update Lease action for an existing tenant. 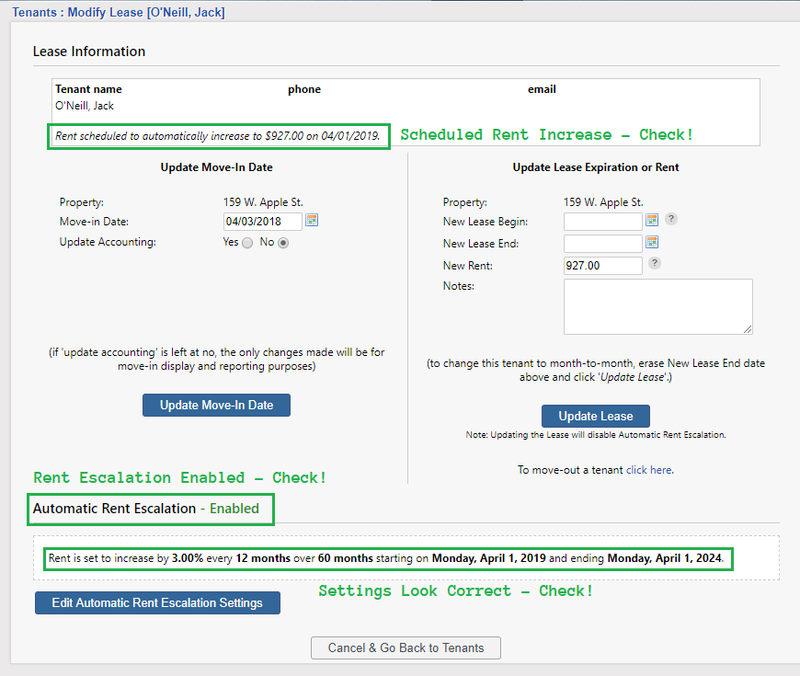 Find and Click the Setup Automatic Rent Escalation button. 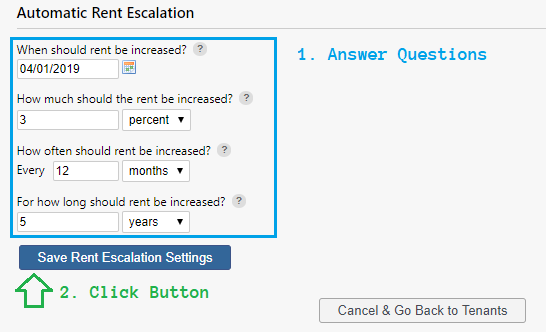 Answer the questions and click the Save Rent Escalation Settings button. Rejoice! Your Automatic Rent Escalation settings are now setup! That’s it! That’s all you have to do! To those of you who spent time doing finger exercises before reading this article, I know it’s hard, you may have been hoping for more steps. Take heart! You can now utilize that finger strength to do other things! As an Automatic Rent Escalation expert you now know how to set up rent escalation using Rentec Direct’s Automatic Rent Escalation feature. Yes! I agree! 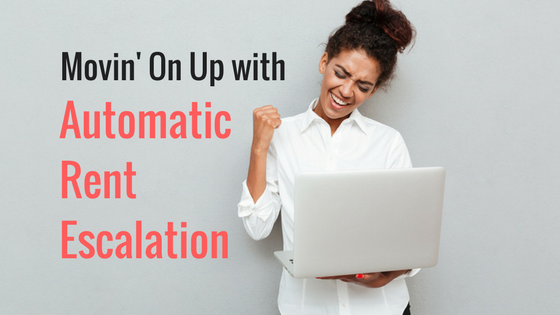 Automatic Rent Escalation is a wonderful tool to help give yourself a break. Rentec Direct offers even more wonderfully wonderful things you can utilize to make your life more wonderfully wonderful. Look, look and you will see! Take a gander at other wonderful things here. As a Full Stack Software Engineer and Web Developer, Jeremy brings a wide array of development experience to the Rentec development team. As an engineer he's solved problems for local businesses as well as implemented complex solutions for large distributed organizations. He approaches every problem as an opportunity to learn, grow, and become a better developer. Does the system automatically notify the tenant in advance, i.e. 60 days? The system can notify you (the property manager) when leases are coming up, but it doesn’t automatically notify the tenant. Generally this feature is most useful when written into your lease (ie.. Rent increases 3% every 12 months). It’s a very common mechanism in commercial leases, and becoming more common in residential as well. To enable notices for upcoming lease expiration for yourself, just visit Settings, Program Defaults. 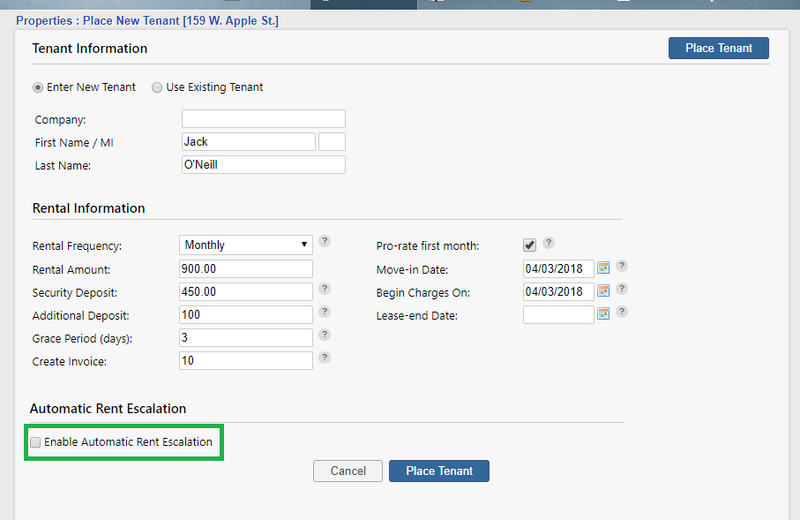 Turn the option to provide notices on expiring leases, then specify the number of days prior to expiration you want to be notified. You can then setup an email template (Settings, Email Templates) to quickly shoot notice out to any affected tenants. We may also explore further automation of notices in the future. Love the feature. Would like to see it round up to nearest 5 or 0 amount when using percentages. Great idea! We are always looking for ways to improve the Rentec Direct system. It’s these kinds of great ideas that help make Rentec Direct better for everyone! I think it is a great idea, even a few dollars makes a significant difference and I would think the resident would rarely move for $5-$10 a month. IT would cost more to move and depending on your costs you need increases to maintain the property and additional property taxes as the values continue to rise. I completely agree. I always recommend that we build routine annual rent increases into our lease agreements. Like you said no one is going to move over a $10-$20 increase, but if you don’t raise the rent for 5 years and suddenly you propose a $100/month rent increase, you might price out of your current tenant’s budget. Plus that additional $10-$20/month each year adds up over time and your looking at solid rental income bump. I just want to say that I love your commentary, it makes reading these articles fun! I’m just laughing here in the background and my boss is like “what’s so funny”, “well umm this awesome Rentec Direct article”. On another note, I am super excited for this new feature. Thank you!!!! I couldn’t agree more Daphne! I was laughing out loud when I read the article too. Great job making a software feature super entertaining to read, Jeremy! Excited to try out this new feature with our property manager! We’ve been running into some issues with unproductive management by our corporate office in the past and have had things like this slip under the radar. Looking forward to seeing how this can improve our administrative functions. Thanks! That Jabberwocky thing actually happened to me in 4th grade. I am cracking up. And the girl I was trying to impress was Ellen Lewis. She was so cute. Great feature, too !